Build knowledge and partnership bridges with Greece’ is the motto of the new national initiative which aims to bring together all Greeks wherever they may be! 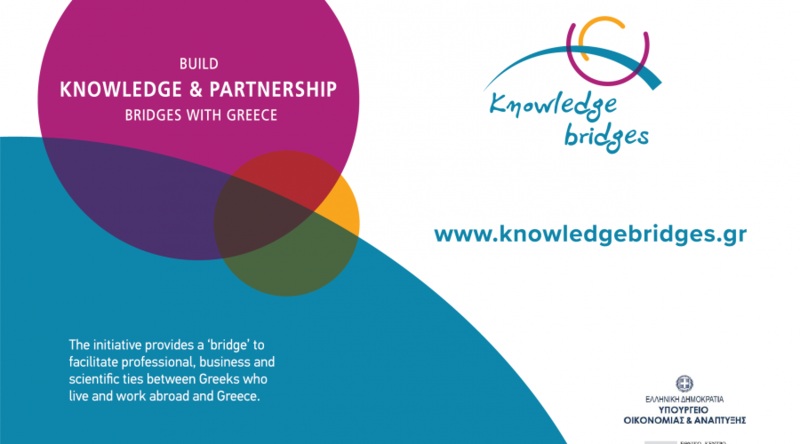 The National Documentation Centre (EKT) is implementing the new national initiative ‘Knowledge and Partnership Bridges’ (www.knowledgebridges.gr), designed by the Ministry of Economy and Development, in co-operation with other ministries and the General Secretariat for Strategy and Private Investment. The key objective of the initiative is to encourage the contribution of Greek scientists and professionals, including those who live and work abroad, in a national effort to develop the country’s ‘knowledge economy’. Through the initiative, support is given to the creation of ‘bridges’ which will enable Greeks living and working abroad to co-operate and leverage business and/or research initiatives with scientists, organisations and businesses in Greece. This, in turn, will facilitate the best possible exploitation of all the specialised human capital at Greece’s disposal; the contribution of such personnel living and working abroad being vital to the strengthening of the economic reconstruction of the country. It is undeniable that human capital, particularly specialised human capital, plays a significant role in the development of the country. However, of equal significance is the mobility of scientists, and specifically the flow of specialised human capital abroad. Taken together, these two factors provide huge potential for building bridges between Greece and Greeks who live and work abroad. Such bridges will greatly help those Greeks living in Greece, especially in the area of entrepreneurship, and those who want to contribute to the country’s development, whether they remain abroad or decide to return. EKT, an institutional body central tothe National Research, Technology, Development & Innovation System (RTDI), has developed a platform through which it provides services to successfully achieve goals and through which there can be documenting, mapping and long term monitoring of the positions and characteristics of specialised human capital who have left Greece. By visiting the initiative’s website you can find partners, information about funding programmes and scholarships in Greece; contribute to a Greek business by selling its products in the country of your residence and employment; help friends who are self-employed or employed by a company in Greece to connect with companies abroad; even set up a business either alone or jointly with others, acting as a mentor/’business angel’ in the formation of a start-up in Greece. Browse the page, find information about funding programmes in Greece and scholarships for studies and research abroad, read the stories of people who have stayed in Greece and been successful, register on the ‘Partners’ page to find partners within Greece or complete the questionnaire specifically designed to record Greek scientific expertise abroad. Essential infrastructure, know-how, Greek researcher databases, human capital and communication networks will be provided by the National Documentation Centre to ensure the successful realisation of all the objectives of the ‘Knowledge and Partnership Bridges’ initiative. During the first weekend of the International Trade Fair Thessaloniki, 9-10th September, Stand 15 was where representatives of the new national initiative, ‘Bridges of Knowledge & Co-operation’, were on hand to inform visitors about the vision and actions of the project. 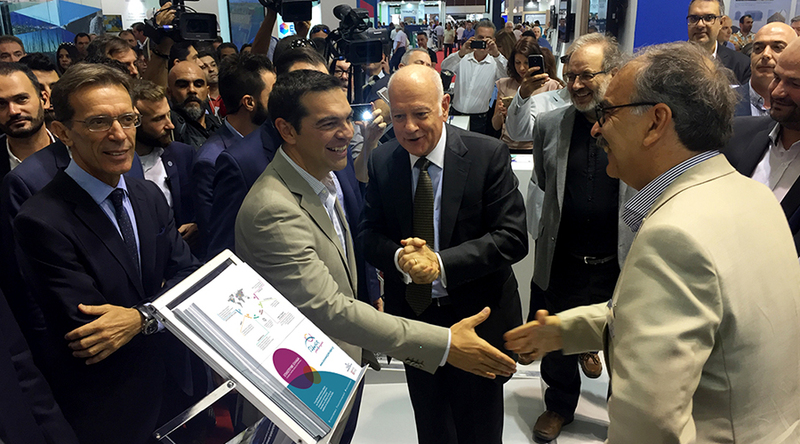 The stand was visited by the Prime Minister, Alexis Tsipras, who congratulated the representatives on the initiative. Over the course of the two days, there were bilateral meetings with representatives of interested organisations. These included among others: the Interconnection Office Macedonia University, the Association of Alumni Aristotle University Thessaloniki, the General Secretariat for Industry, the Luxemburg Consulate in Thessaloniki, the NSRF Publicity Department and Greek scientists from abroad. ‘Knowledge and Partnership Bridges’ begins it tour of cities with large concentrations of Greek scientists and professionals. The first two experiences will be in Berlin and Stockholm on 14th and 21st October respectively. The General Secretary for Strategy and Private Investment, Professor Lois Lamprianidis will present the initiative at the two-day conference, "New Greek Immigration", to be held by the Hellenic Scientists Association Berlin/Brandenburg on 14-15th October in Berlin. The goal is the interdisciplinary exploration of the multifaceted aspects of this phenomenon and the development of a wider debate and reflection between the scientific community, the Greek and German players and the immigrants themselves. The next stop for ‘Bridges’ will be Stockholm, a week later. The event will be on Saturday 21st October at 17:00 at the Greek Cultural Home Stockholm. Organisers of the event are the Greek Embassy in Sweden, the Federation of Greek Associations and Communities of Sweden, the General Secretariat for Strategy and Private Investment of the Ministry of Economy and Development and the National Documentation Centre. Speakers will include the General Secretary for Strategy and Private Investment, Professor Lois Lamprianidis and the National Documentation Centre Director Evi Sachini. You can follow ‘Knowledge and Partnership Bridges’ on Facebook, Twitter and LinkedIn.